Add a three dot sight for 5X more accuracy. Line up the front and rear dots to increase your night fire accuracy with Trijicon® Bright & ToughTM Night Sights for your Sig Sauer® model handgun. 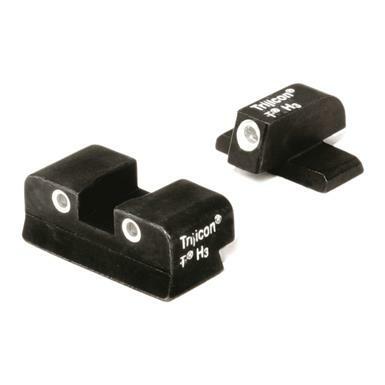 Self-luminous tritium phosphor front and rear sights along with your instinctive shooting speed combine to put you on target without the need to change batteries or wait for powering-up. Shock-resistant construction and aluminum cylinders protect the lamps from damage. Sapphire jewel window distributes light evenly while white rings add daylight visibility. Handgun Make and Models: Sig Sauer® calibrated for 40S&W, .45ACP including P220, P229, P240, P245, P938, Pro233, Pro2340, Pro245. Have your eyes opened to faster, easier targeting. Reach new heights for accuracy. Visibly brighter and faster sight acquisition.